Automated Micro-Needling (also known as Collagen Induction Therapy or CIT) is a new innovation in aesthetic medicine for treating the appearance of fine lines, acne scars and improvement of the skin’s overall appearance. During this procedure, tiny needles are used to create controlled micro-injuries to the skin in order to produce collagen and elastin. The skin’s repair process results in improvement and the appearance of softer wrinkles. Automated micro-needling also creates superficial micro-channels which can be used with topical gels, creams and serums to help improve the appearance of the skin. Eclipse MicroPen ™ is the most advanced medical-grade automated micro-needling device on the market. What are the benefits of microneedling therapy? The benefits of micro-needling are a reduction in the appearance of fine lines and wrinkles, younger-looking skin with fewer signs of aging. Eclipse Micropen™ can also have a positive effect on hyperpigmentation as well as on hypo-pigmentation, acne scars, traumatic scars and stretch marks and generally creates a fresher appearance or glow to the skin. Eclipse Micropen™ can be used on all parts of the body, including face, neck, décolleté, arms, hands, legs, abdomen and back. How is a microneedling procedure like? First, a topical gel is applied to clean skin. In most cases, we will use a hyaluronic acid peptide gel. This is a soothing product that helps the MicroPen™ tip glide across your skin while delivering topical Hyaluronic Acid (HA) – the building blocks for healthy new skin – deep into the skin. Then, we will select the appropriate pen setting and number of passes to address your skin’s specific needs. As the Eclipse MicroPen™ tip is applied to the skin thousands of superficial micro-channels or holes are created every second. The process stimulates your skins natural ability to heal itself. This repair process begins almost immediately. As a result, new collagen and elastin produce softer, firmer skin and reduce the appearance of wrinkles, acne scars and textural issues. Typically the skin has a nice glow to it immediately following the treatment. Results can be observed as early as 30 days. Acne can be caused by several known factors. Hormones, stress, diet and other variables can lead to acne breakouts. Untreated or poorly managed acne can lead to scarring. The three most common types of acne scars are Ice pick scars, boxcar scars, and rolling scars. The scars are deep and narrow, which makes it difficult for them to be filled up naturally with collagen and some are too deep to heal entirely. Ice pick scars are usually less than 2mm across and usually caused by inflamed comedones (blackheads) or acne vulgaris (whiteheads). This acne scar type is the hardest to treat. Boxcar scars are similar to Ice Pick scars, however, the Boxcar scars are wide and more rectangular with vertical edges. Boxcar scars are usually found on the temples and cheeks and they can be deep or shallow, but the majority of Boxcar scars are not as deep as Ice Pick scars. 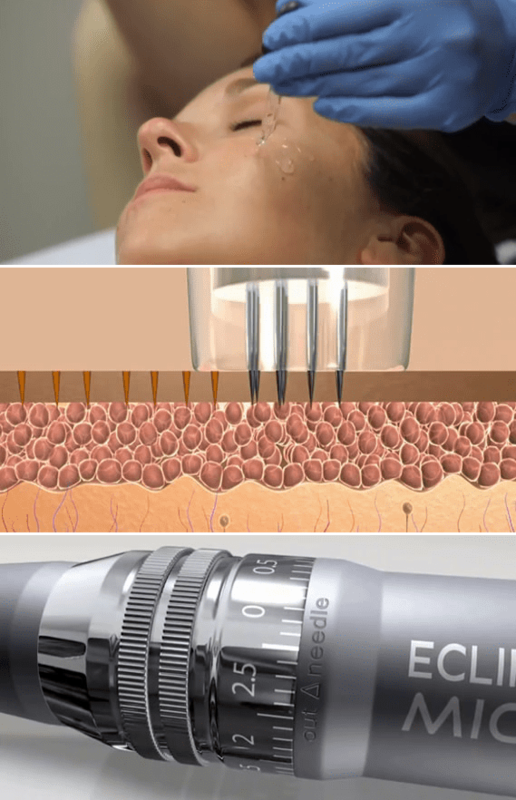 What will I feel during a microneedling procedure? How long does a microneedling procedure take? The total healing time depends on the Eclipse MicroPen setting used and the number of overlapping passes your skincare professional performs. On average, patients are red up to 2 to 4 days. Some patients heal completely in as little as 24 hours. How is MicroPen different from other treatments? MicroPen is different from needling rollers in that automated micro-needling devices move in a vertical direction for better precision when treating the skin. Unlike Automated Micro-needling the roller does not create a precise vertical action. MicroPen is different from lasers because Eclipse MicroPen™ breaks up pigment mechanically and remodels the collagen without heat. Removing the heat created by the laser from the equation makes for a safer, more comfortable treatment with a very low complication rate, especially in darker skin types.